After 2 weeks of renovation, Our day diving boat, Fei-Fei was ready to serve her first guests from Central Oregon' (USA) dive group lead by Walt Bolton. With its new layout, and improved accessibility around the boat, Walt's group has given the all thumbs up! Come by our booth (IN-01, Indonesian Pavilion) and get the latest news & promotions! Martinus and Andrew will be present at ADEX to answer all your questions and share a laugh or two! From 31 March 2010, our 4 new Water's Edge Duplex Villa Rooms will be available for booking! 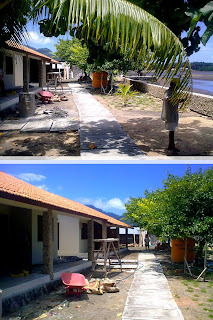 With this 4 new rooms, it brings a total of 22 Rooms in Cocotinos Manado: 12 Duplex Villa Room, 8 Water's Edge Duplex Villa Room and 2 Suites. Click here for more information on Water's Edge Villa Rooms. Odyssea Divers - Euro Divers International operates out of Cocotinos Manado, a Boutique Beach Resort, situated on a chocolate-coloured beach in the heart of the fishing village of Kima Bajo, within picturesque Wori Bay. Cocotinos Manado is a 22-room resort, comprising 12 Duplex Villas, 8 Water's Edge Villas and 2 spacious Suites. 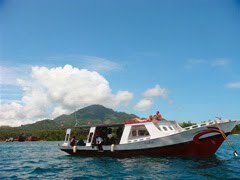 The resort is conveniently located, being only a 25-min car ride from Sam Ratulangi International Airport and a mere 20-min boat ride to Bunaken Island. This charming resort is the first property built and managed by PT Odyssea Utama which owns Odyssea Divers. Guest rooms are designed and furnished to provide all the comfort and convenience expected by the modern traveller. Odyssea Asia Pte Ltd (Since 2004). Picture Window theme. Powered by Blogger.